In this area of the Apparel Search fashion brand directory, you will find men's fashion brands from leading apparel companies and fashion designers. On this particular page, you will find information regarding men's clothing with the Cole Haan brand. 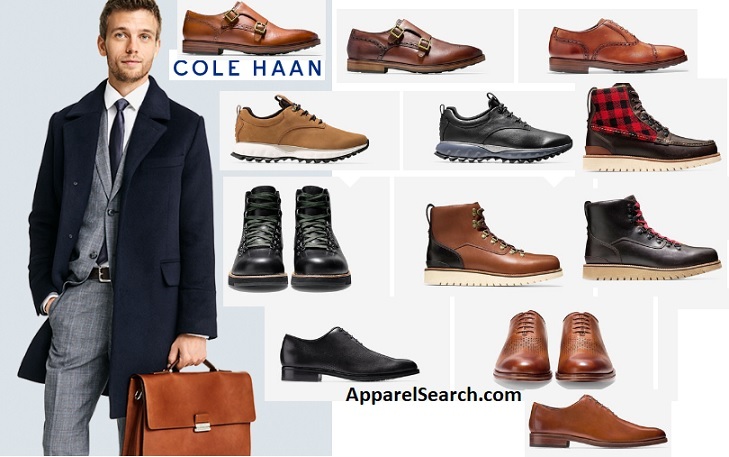 You are welcome to utilize this section of our clothing guide to review Cole Haan news, Cole Haan blog posts, Cole Haan photos, and more. Please understand that you may run into a few photos or a tad of information that does not actually pertain to the men's Cole Haan fashion brand. Unfortunately, no search technology is absolutely perfect. We will continue to do our best to bring you as much information about the men's Cole Haan fashion collection as possible. Cole Haan is a global lifestyle brand with a focus on men's and women's footwear and accessories. Founded in Chicago, Illinois, United States, in 1928. Cole Haan products are sold at retailers such as Nordstrom, Shoe Carnival, Zappos, Macy's, Lord & Taylor, Neiman Marcus, Hudson's Bay Company and other department stores and independent stores nationwide, as well as through its own outlet stores found in outlet malls throughout the country. Additionally, Cole Haan has stores and shop-in-shops globally. On November 16, 2012, Cole Haan was bought by Apax Partners Worldwide LLP for $570 million from Nike, Inc. Learn more about men's Cole Haan shoes and fashion. If you have changed your mind and do not wish to research the brand Cole Haan, you can use the search engine on this page to find another clothing label that may be of more interest. You may also want to learn about the Nike brand for men. Apparel Search is a leading guide to fashion, style, clothing, glam and all things relevant to apparel. We hope that you find this Cole Haan page to be helpful. Trafton Cole and Eddie Haan began Cole Haan in 1928, resolving to make good goods and nothing but good goods.